It's a cheap gaming laptop that also looks good. First Lenovo learned to make cheap gaming laptops. Now it’s learned to make cheap gaming laptops that also look good. 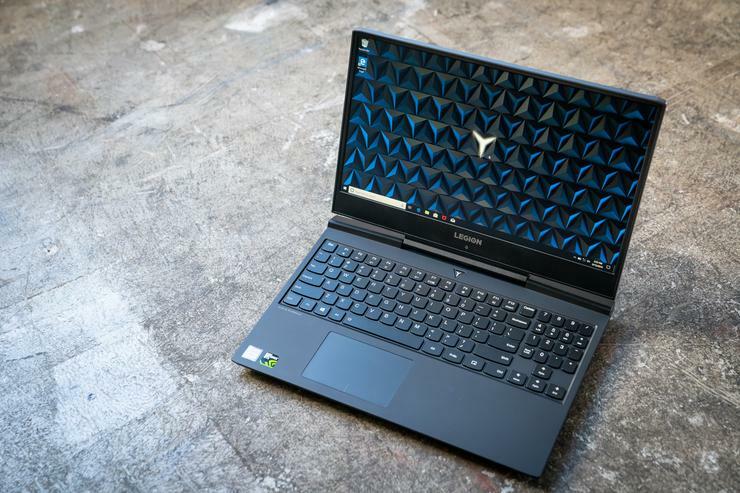 I’ve spent the last few weeks with the Lenovo Legion Y7000, a stopgap release that sticks with Nvidia’s GTX 10-series graphics cards as Lenovo’s flagship Y500 and Y700 models start to transition to higher-end (and higher-priced) RTX 20-series GPUs. Is it a performance monster? The type of laptop you buy to impress your friends? Absolutely not. But it’s a smart, sophisticated option that will perform admirably for at least a few years—and at a competitive price point. Lenovo’s never one to shy away from options, and the Legion line seems to get more and more convoluted every generation. Case in point: The Y7000 and the Y530 are essentially the same laptop, but in a different skin. Last year we took a look at the cheapest Y530 model. This year, the opposite as we delve into the most expensive Legion Y7000—though “most expensive” sounds scarier than it should. 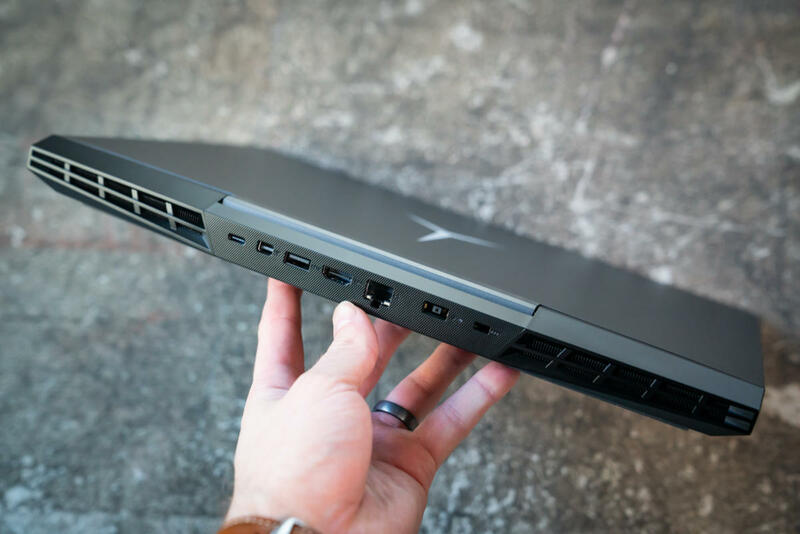 Even fully tricked out, the Y7000 we reviewed retails for about $1,100 (though the price varies from place to place, as it’s not directly sold by Lenovo). It’s a decent price for what you get: An Intel Core i7-8750H processor, Nvidia’s GeForce GTX 1060 graphics, 16GB of RAM, a 256GB SSD and a 1TB 7200 RPM HDD. And the model we reviewed is the optimal setup, to my mind. There are a few other options, including a $1,000 model with only 8GB of RAM and no secondary hard drive. There’s also an ultra-budget option in the $800 range, but that model’s i5-8300H and GTX 1050 Ti are a poor investment for games today, let alone going forward. Lastly, there’s a second $1,100 model that omits the 1TB hard drive in favor of upgrading from the 256GB to a 500GB SSD, but given the size of games these days I’d feel safer taking the larger overall space. That said, an SSD is both faster and more reliable, so if you’re diligent about finishing and then uninstalling games then that particular variant could be useful. 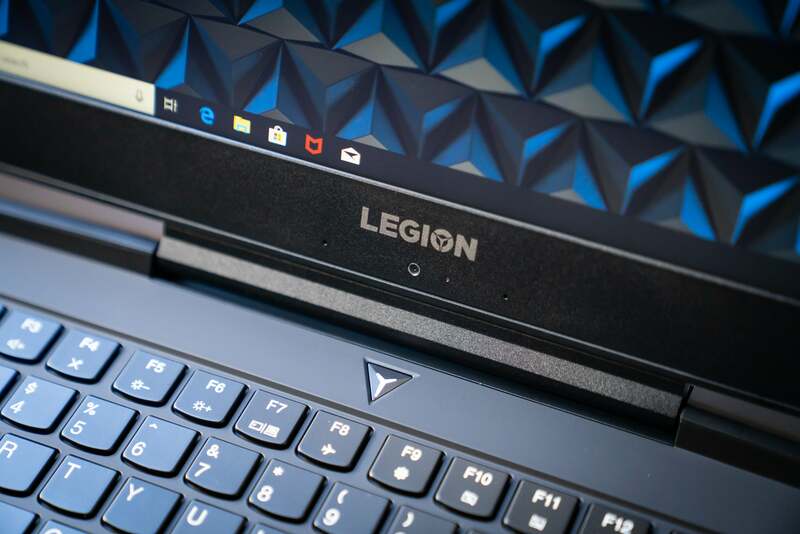 Last year we described the Lenovo Legion Y7000’s counterpart, the Y530, as a “generic business machine.” The Y7000 is the opposite, unmistakably a gaming laptop—albeit one that’s a hair classier than its peers. The Legion Y7000 measures 14. 2 by 10.5 by 1.0 inches and weighs a smidge over 5 pounds. That makes it smaller (and significantly lighter) than your average “desktop replacement” gaming machine, but still not nearly as portable as, say, the Razer Blade. The base is especially dense, a thick hunk of plastic that nevertheless hides some of its bulk with sharply tapered edges. It’s nicely complemented by the lid, thin and aluminum-plated, with Lenovo’s distinctive “Y” logo backlit in white. There’s no other external branding, which is a classy (and confident) touch. Pop the lid open and you’ll find a 15.6-inch IPS display with a 1920x1080 resolution, a standard 60Hz refresh rate, and a slightly underwhelming 277 nits maximum brightness. It’s not a great screen, and you won’t want to do any color-intensive work on it, but there are no surprises here either. It’s exactly the display you’d expect to see in a mid-tier gaming laptop. And the Legion Y7000’s slim top and side bezels are a real coup at this price, helping reduce its overall footprint. There’s a compromise, though. Or rather, two compromises. First of all, the webcam is placed at the bottom of the screen, which is never a flattering angle. It’s a shame Lenovo couldn’t figure out a way to embed it at the top like Razer did with the similarly slim Blade. The second issue: Lenovo’s opted for a full keyboard complete with numpad and arrow keys, but because of the thin bezels there’s less room to work with on the base as well. Thus the keyboard is slightly condensed, with the Escape key pressed up against F1 and the right edge of the typing field brushing the numpad. Personally I think Lenovo would’ve been better off omitting the numpad entirely. You gain almost nothing from it, especially when it comes to gaming, and meanwhile it’s comically hard to pinpoint the Backspace key. I was constantly misfiring the “4” on the numpad, my finger expecting a gap and then not finding one. On the other hand, it’s nice to have full-size arrow keys. Pointless, maybe—you rarely use them for games nowadays so again, they could have been omitted or shrunk to make more room for the main keyboard. But I often take advantage of the arrow keys when writing, or while browsing the internet, and the Legion Y7000’s setup is a lot more practical for those purposes than the half-sized arrow keys you usually find on laptops. It’s a fairly pleasant machine to write on as well, with a stiff but snappy response to the keys, and white backlighting. The trackpad is offset to the left, centered on the space bar instead of the laptop itself. That’s fairly standard on gaming laptops, but it can take some time to adjust. More annoying is that there are no discrete mouse buttons, though if you’re gaming on a laptop you’ll probably want to plug a mouse in. Be warned that both trackpad and the surrounding soft-touch plastic pick up more than their fair share of fingerprints and grease smudges. The “Fresh New Laptop” look doesn’t stick around for long. The speakers are unremarkable, but loud—which is good, because so are the fans. The Lenovo Legion Y7000 runs fairly cool for day-to-day use, enough so the fans didn’t kick on while watching video. Games result in an immediate whoosh of air though. That’s to be expected from gaming laptops of course, and the Y7000 is admittedly less shrill than slimmer laptops like the Blade, but even so the fan noise was loud enough to be distracting. Invest in a decent gaming headset. My only remaining complaint: Rear ports. So many rear ports. 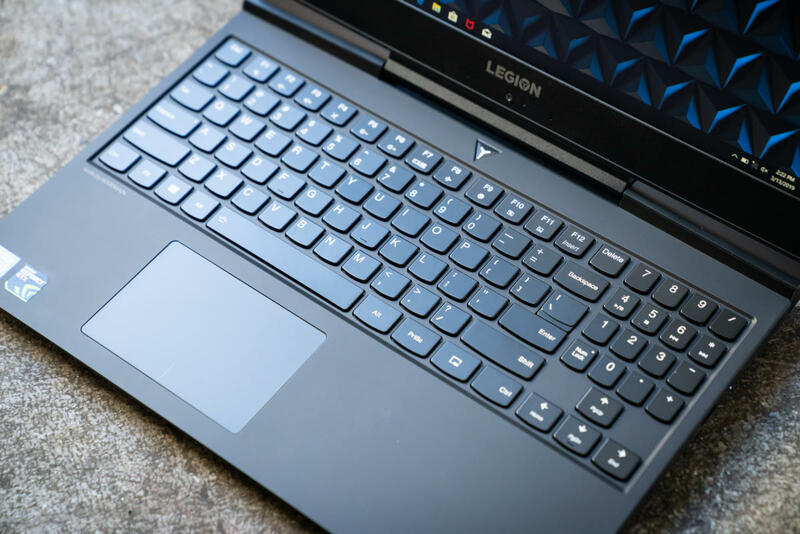 The Legion Y7000 has a 3.5mm jack on the left side, plus a single USB 3.1 port on both the left and right side. Everything else is on the back, including another USB 3.1 port, a USB-C port, HDMI and Mini-DisplayPort, ethernet, a lock, and the rectangular charging port. Rear ports are great if you plan to set your laptop up on a desk, as it’s easier to hide the clutter. They’re a pain when you want to use your laptop like an actual laptop though, and I prefer my inputs arrayed on the left and right sides with additional vents at the back. Mid-tier price, mid-tier performance. 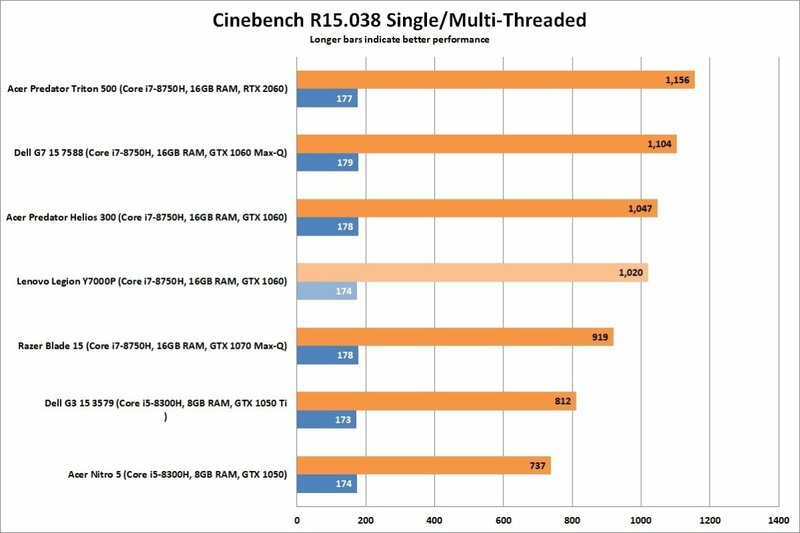 That’s exactly what Lenovo promised with the Legion Y7000 and exactly what it delivered when we ran it through our benchmark gamut. The GeForce GTX 1060 is a well-established piece of hardware at this point, and even the i7-8750H is familiar territory. The Y7000 put up the expected numbers against similarly equipped peers like the Acer Predator Helios 300, and blew away the GTX 1050-equipped Lenovo Legion Y530 we tested last year. First up is Cinebench, which measures a CPU’s short-term performance. The Y7000’s score of 1,020 won’t turn any heads, nor does it best the aforementioned Acer machine. It’s well within the margin of error though, which is no surprise. These machines are basically identical, and thus put up basically identical scores. That’s what you want to see, actually! It means there’s nothing fundamentally wrong with the Legion Y7000, no aggressive throttling or heat-related problems to hunt down. 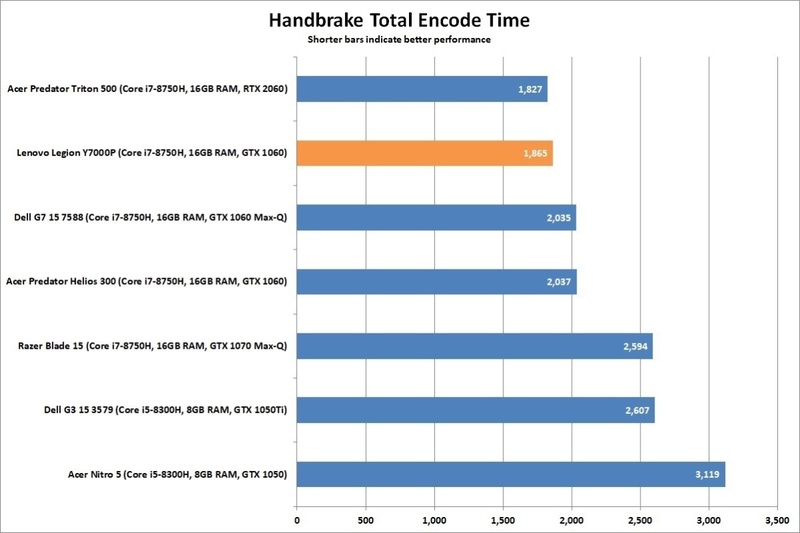 The same is true of our Handbrake test, which gives the CPU a lengthier task to complete. We re-encode a 30GB MKV file down to the “Android Tablet” preset, which takes about a half-hour on most modern gaming laptops, thus allowing us to measure how heat affects system performance. In the Y7000’s case? Not much. In this case we see slightly higher scores than the MSI and Acer machines, though again the differences are negligible. 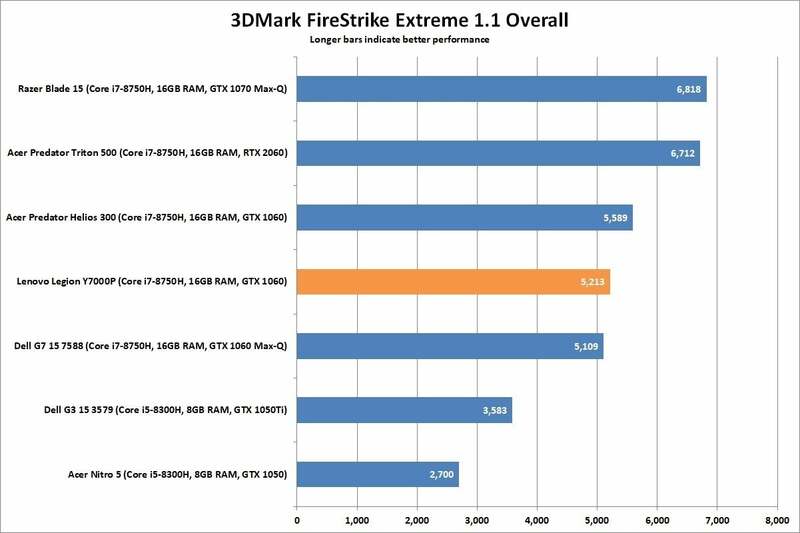 Moving onto the graphics performance, we first ran the Y7000 through 3DMark’s FireStrike Extreme benchmark. This one’s close enough you could probably call it a tie, though the Acer Predator Helios 300 pulled slightly ahead. 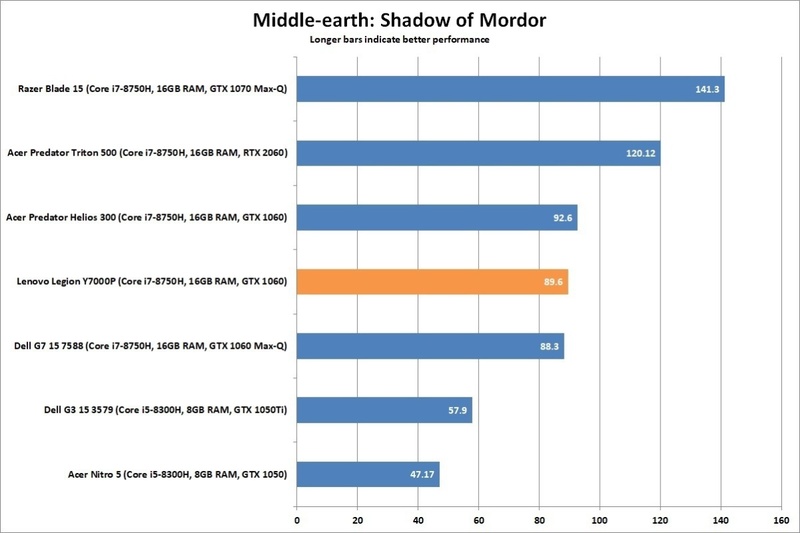 And for real-world gaming performance, we tested the Legion Y7000 with both Rise of the Tomb Raider and Middle Earth: Shadow of Mordor. Both these games are long in the tooth at this point, and a laptop like the Y7000 should easily handle these benchmarks, even with both maxed out at 1920x1080. Indeed it did, putting up 72.0 frames per second in Rise of the Tomb Raider and 89.6 frames per second in Shadow of Mordor. You guessed it: Both are within the margin of error for a tie, compared with the Acer and MSI machines. And both are respectable, indicating that you’re set to game at High or Very High presets for a few more years. That said, it’s worth looking at how large the jump is between the GTX 1060 and RTX 2060 machines. 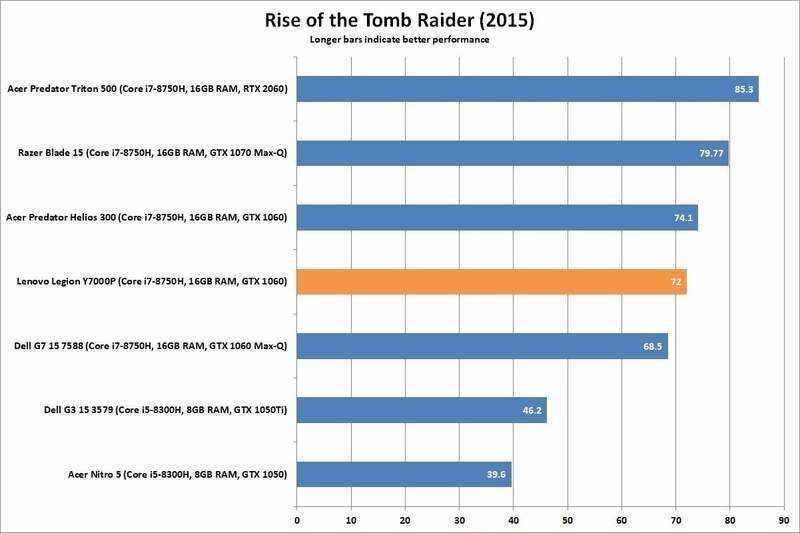 We recently tested a 2060-equipped Acer Predator Triton 500, and that put up scores of 85.3 and 120.1 frames per second in Tomb Raider and Shadow of Mordor respectively. That’s a fairly significant gap, and of course the GTX 1060 is hardware at the end of its lifespan while the RTX 2060 is just starting up. Given we also have a console refresh coming in the next few years, just be aware that any 1060-equipped laptop isn’t as future-proofed as you might like from an $1,100 machine. Lastly, our battery test. We typically run this at 250 nits, which the Y7000’s 277 nit screen is juuuust capable of hitting. Once the display is set we loop a 4K video file, unplug the laptop, and wait for it to die. 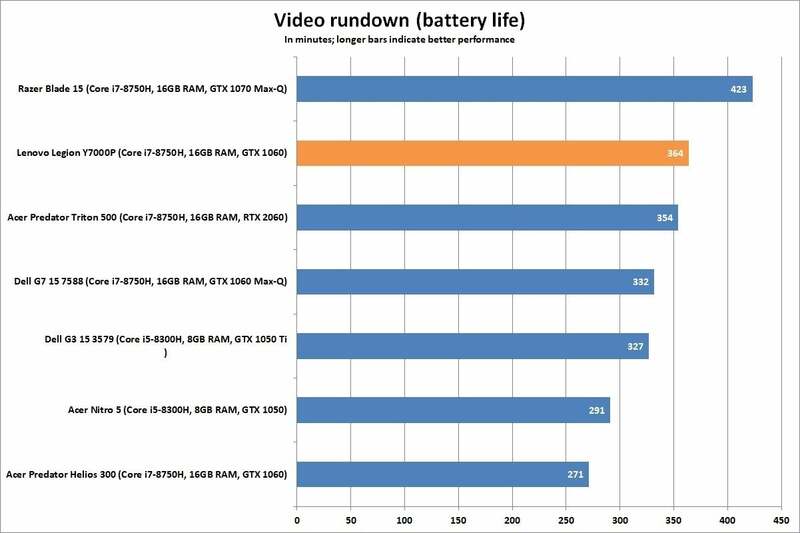 The Legion Y7000’s 57 watt-hour battery went through this process in a little over 6 hours, which is excellent for a laptop of this type—though real-world gaming performance will undoubtedly rate lower. You’re lucky if you get more than two to three hours of playtime from any gaming laptop. 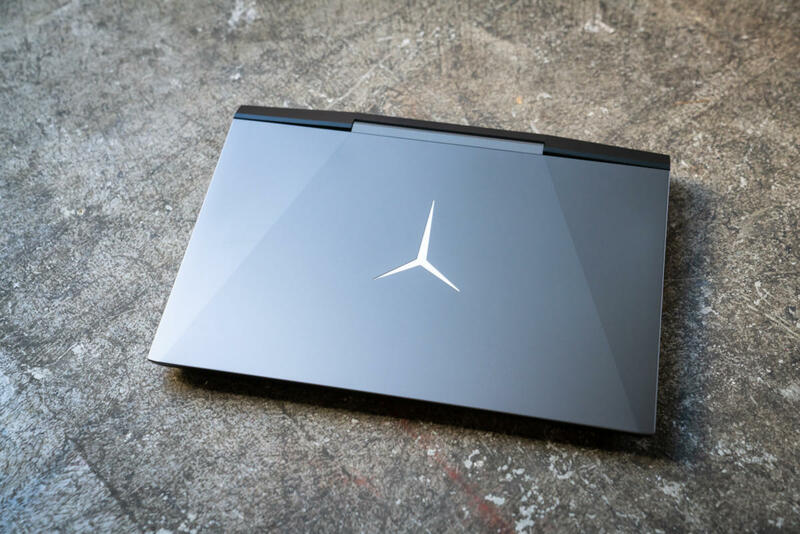 It can be hard to stand out in the mid-tier gaming laptop market these days, but the Lenovo Legion Y7000 is certainly worth a second look from prospective buyers. There are other laptops with similar specs, but few as all-around solid. For instance, the aforementioned Acer Predator Helios 300 is slightly cheaper and has a better display—but it’s also bulkier, sports an edgier (or, if you’re like me, uglier) red-and-black color scheme, and doesn’t include the 1TB hard drive. And the MSI GS65 Stealth is far more portable, but retails for over $1,500.